Gasunie, the Dutch/German TSO for GAS announced on June 30, 2016 that it will invest in a power-to-gas installation at the site of the gas storage location near Zuidwending in the Dutch province of Groningen. Gasunie subsidiaries EnergyStock and New Energy aim to convert sustainable electricity into hydrogen at its Underground Gas Storage Zuidwending in Groningen using approximately 5,000 solar panels. 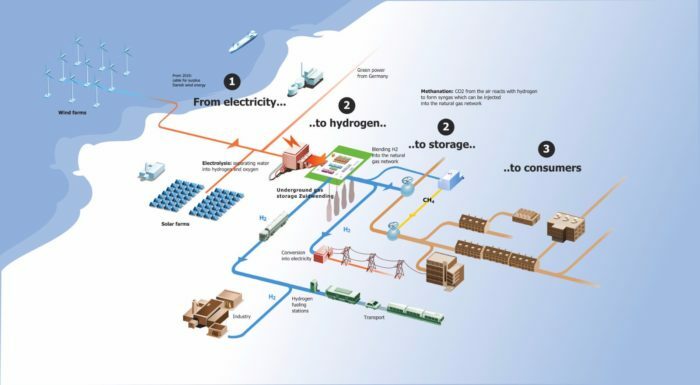 In addition, sustainable energy will be delivered to the project from Tennet’s high-voltage electricity grid. This pilot project (HyStock) will be the first power-to-gas facility in the Netherlands with a capacity of 1 Megawatt. The location is ideal because it offers the opportunity of future large-scale storage of hydrogen in salt caverns made suitable for gas storage. Through HyStock, the Gasunie subsidiaries aim to contribute, together with market parties, to the further development of the hydrogen market and apply new technologies on a larger scale. The project is part of the recently approved TSO202 project co financed (60%)by the EU Commission facilitated by the EHA in cooperation with the ministry of Infrastucture and Environment and energy Valley, a regional energy agency.